Join Us!!! We are looking for someone to help us cover NBA-G-League men basketball. Please send us an e-mail. Here is the last day review presented by ESL. The most crucial game of the last day was another loss of top-ranked Warriors (31-15) in Bismarck on Monday night. Hosts were defeated by fourth ranked Lakers (21-27) 113-108. Lakers had a 44-33 advantage in offensive rebounds. They looked well-organized offensively handing out 33 assists. Worth to mention a great performance of guard Jemerrio Jones (196-95, college: N.Mexico St.) who helped to win the game recording a double-double by scoring 15 points, 10 rebounds and 5 assists. Forward Travis Wear (208-90, college: UCLA) contributed with 16 points, 7 rebounds and 5 assists for the winners. 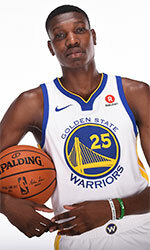 Mexican-American forward Juan Toscano (198-93, college: Marquette, agency: BeoBasket) answered with a double-double by scoring 15 points, 12 rebounds and 5 assists for Warriors. Lakers have a solid series of four victories in a row. They maintain fourth place with 21-27 record, which they share with Canton C. Warriors at the other side still keep top position with 15 games lost. The game between fourth ranked Canton Charge (21-27) and 5th ranked Blue Coats (18-28) in Canton ended with biggest points difference. Canton Charge beat guests from Newark, Delaware 104-97. Guard Levi Randolph (196-92, college: Alabama) stepped up with a double-double by scoring 22 points and 12 rebounds for the winners and Muhammad-Ali Abdur-Rahkman chipped in 24 points and 4 assists. At the losing side guard Shake Milton (198-96, college: SMU) responded with 26 points and 5 rebounds. Blue Coats' coach rotated ten players in this game, but that didn't help. Canton Charge have a solid series of three victories in a row. They maintain fourth place with 21-27 record, which they share with South Bay L. Blue Coats lost fourth consecutive game. They keep the fifth position with 28 games lost. The game between fourth ranked Canton Charge (21-27) and 5th ranked Blue Coats (18-28) in Canton ended with biggest points difference. Canton Charge beat guests from Newark, Delaware 104-97. Canton Charge dominated down low during the game scoring 58 of its points in the paint compared to Blue Coats' 38. They shot the lights out from three nailing 13 long-distance shots on high 59.1 percentage. Canton Charge players were unselfish on offense dishing 22 assists. Guard Levi Randolph (196-92, college: Alabama) stepped up with a double-double by scoring 22 points and 12 rebounds for the winners and guard Muhammad-Ali Abdur-Rahkman (193-94, college: Michigan) chipped in 24 points and 4 assists. At the losing side guard Shake Milton (198-96, college: SMU) responded with 26 points and 5 rebounds and forward Haywood Highsmith (201, college: Wheeling Jesuit) scored 15 points and 6 rebounds. Both teams had four players each who scored in double figures. Blue Coats' coach rotated ten players in this game, but that didn't help. Canton Charge have a solid series of three victories in a row. They maintain fourth place with 21-27 record, which they share with South Bay L. Blue Coats lost fourth consecutive game. They keep the fifth position with 28 games lost. The most crucial game of the last day was another loss of top-ranked Warriors (31-15) in Bismarck on Monday night. Hosts were defeated by fourth ranked Lakers (21-27) 113-108. Lakers had a 44-33 advantage in offensive rebounds. They looked well-organized offensively handing out 33 assists. Worth to mention a great performance of guard Jemerrio Jones (196-95, college: N.Mexico St.) who helped to win the game recording a double-double by scoring 15 points, 10 rebounds and 5 assists. Forward Travis Wear (208-90, college: UCLA) contributed with 16 points, 7 rebounds and 5 assists for the winners. Mexican-American forward Juan Toscano (198-93, college: Marquette, agency: BeoBasket) answered with a double-double by scoring 15 points, 12 rebounds and 5 assists and point guard Antonius Cleveland (198-94, college: SE Missouri St.) added 17 points, 5 rebounds and 6 assists in the effort for Warriors. Both teams had five players each who scored in double figures. Lakers have a solid series of four victories in a row. They maintain fourth place with 21-27 record, which they share with Canton C. Warriors at the other side still keep top position with 15 games lost. Finals MVP: Isaiah Hartenstein (6'11''-F/C-98) of Houston R.
Player of the Year: Chris Boucher (6'10''-C/F-93) of Toronto R.
Guard of the Year: Jordan Loyd (6'4''-G-93) of Toronto R.
Forward of the Year: Chris Boucher (6'10''-C/F-93) of Toronto R.
Center of the Year: Alan Williams (6'8''-C-93) of Brooklyn N.
Defensive Player of the Year: Chris Boucher (6'10''-C/F-93) of Toronto R.
Coach of the Year: Will Weaver of Long Island N.
C/F: Chris Boucher (6'10''-C/F-93) of Toronto R.
G: Jordan Loyd (6'4''-G-93) of Toronto R.
G/F: Jordan McRae (6'6''-G/F-91) of Washington W.
C: Alan Williams (6'8''-C-93) of Brooklyn N.
F/C: Isaiah Hartenstein (6'11''-F/C-98) of Houston R.
G: Walter Lemon Jr. (6'3''-G-92) of Chicago B.
F: Theophilus Pinson Jr. (6'6''-F-95) of Brooklyn N.
F/G: PJ Dozier (6'6''-F/G-96) of Boston C.
F: Amile Jefferson (6'9''-F-93) of Orlando M.
PG: Kalin Lucas (6'1''-PG-89) of Grand Rapids D.
F: Christian Wood (6'10''-F-95) of N.Orleans P.
Rio Grande Valley Vipers celebrated G-League title. 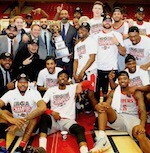 They fired past Long Island Nets in the decisive third game of the championship series. Rio Grande Valley Vipers made 19-of-25 free shots (76.0 percent) during the game. They looked well-organized offensively handing out 29 assists. Great defensive blocking was one of the keys in this match when Rio Grande Valley Vipers made 8 blocks. It was a good game for German power forward Isaiah Hartenstein (211-98) who led his team to a victory with a double-double by scoring 30 points and 17 rebounds. Guard Michael Frazier (193-94, college: Florida) contributed with 24 points, 9 rebounds and 6 assists for the winners. Rio Grande Valley Vipers' coach used a ten-player rotation which allowed the starters a little rest for the next games. Center Alan Williams (203-93, college: UCSB) answered with a double-double by scoring 26 points and 21 rebounds (went 8 for 8 at the free throw line) and guard Jordan McLaughlin (185-96, college: USC) added 22 points, 5 rebounds, 9 assists and 5 steals in the effort for Long Island Nets. Five Rio Grande Valley Vipers and four Long Island Nets players scored in double figures. Rio Grande Valley Vipers knocked down Long Island Nets to even the championship series at 1-1. The decider is schedule for Friday. Rio Grande Valley Vipers looked well-organized offensively handing out 28 assists. 25 personal fouls committed by Long Island Nets helped opponents get some easy free throw opportunities. German power forward Isaiah Hartenstein (211-98) orchestrated the victory with a double-double by scoring 33 points (!!!) and 13 rebounds. Forward Dakarai Tucker (196-94, college: Utah) contributed with 23 points, 8 rebounds and 5 assists for the winners. Rio Grande Valley Vipers' coach used entire bench which allowed the starters a little rest for the next games. Forward Theophilus Pinson-Jr (198-95, college: UNC) replied with a double-double by scoring 32 points, 11 rebounds and 5 assists and forward Thomas Wimbush (201-93, college: Fairmont St.) added 21 points and 5 rebounds in the effort for Long Island Nets. Both teams had five players each who scored in double figures. Do not copy, redistribute, publish or otherwise exploit information that you download from the site ! Do not encumber, license, modify, publish, sell, transfer or transmit, or in any way exploit, any of the content of the site, nor will you attempt to do so.